Zamir Davis announces that he'll attend Millersville University at Delaware Valley Charter High School's first-ever 'signing day' event. Nineteen young men wearing orange jerseys sat at a long table in the Delaware Valley Charter High School gym on Wednesday to talk about their futures. 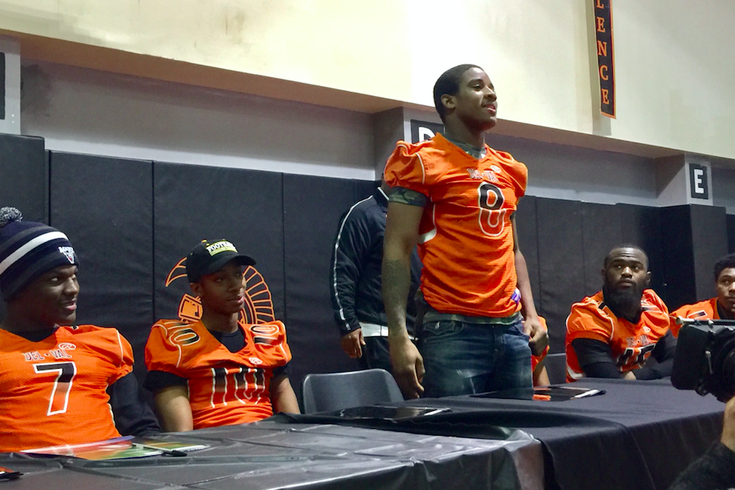 While much of the National Signing Day attention focuses on what big-name program recruited the most five-star prospects, this event at a high school located on Old York Road not too far from Albert Einstein Medical Center was a source of pride for different reasons. According to Principal Michelle Brown – she high-fived all of the players before speaking to the assembled crowd of parents, coaches and teammates – it’s the first time Del Val has hosted a “signing day” event. The Del Val Warriors had a successful season, finishing 8-5. Their last game was a 36-22 loss in the state 3A quarterfinals to Notre Dame-Green Pond (Easton). To hear Coach Troy Gore tell it, though, it was a roller-coaster ride of a season. 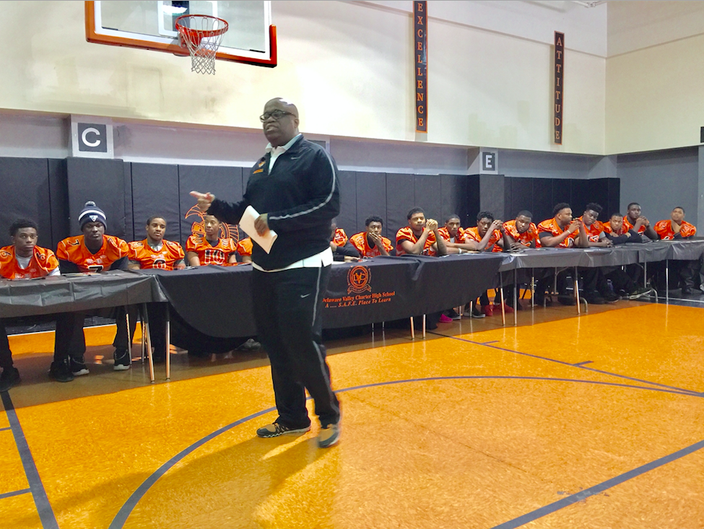 Troy Gore, coach of the Delaware Valley Charter High School Warriors football team proudly introduced 19 graduating seniors who will attend college next school year at the school's first-ever 'signing day' event on February 1, 2017. As the season was getting underway, Gore voiced concerns that a dearth of Public League media coverage could hinder his players’ abilities to get noticed by recruiters. He continued banging that drum all fall, and was clearly able to help facilitate recruiters seeing his players. Gore personally introduced and offered life details on each player, including one who has a son for whom he works to provide. Donte Riley, the program’s offensive coordinator, said helping these young men find success in the future was the point all along, more so than wins and losses on the field. 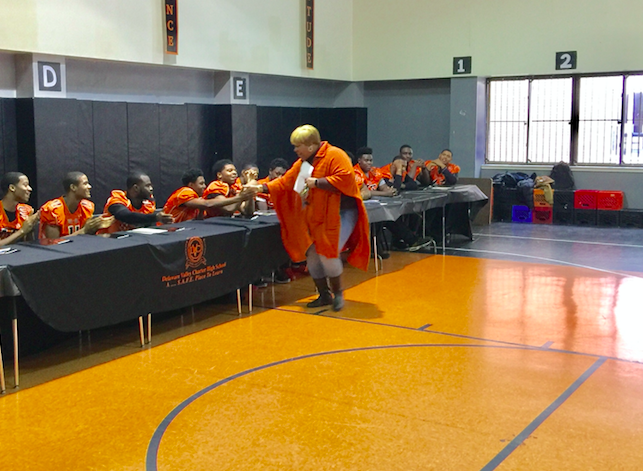 Michelle Brown, principal of Delaware Valley Charter High School, congratulates senior football players at the school's first-ever 'signing day' event. Nineteen players on the team announced where they'll be attending college next year on February 1, 2017.